WHAT ARE CBD GUMMIES? CBD gummies are sweet and chewy supplements that give you the many wellness benefits of CBD in tasty, easy-to-manage doses. You can choose from simple berry-flavored gummies and those boosted with other healthful nutrients. ANY SIDE EFFECTS? Unlike many pharmaceutical drugs, CBD does not cause any known side effects, including no psychoactive effects. WHY CBDFX? To get the full benefits of CBD, you want products that are “full spectrum.” They come with all of the healing compounds that exist naturally within the cannabis plant, rather than just isolated components of its oil. In our gummies, the CBD is derived from plants grown organically at our state-of-the-art partner farms in Europe. Along with the high-quality CBD oil, our vegan CBD gummies are made from organic, non-GMO, 100 percent vegan ingredients. They contain no corn syrup, artificial sweeteners, or any other harmful chemicals. Check our labels to see how pure and natural these CBD gummies are. One of our most favored forms of delivery is our vegan, 100% natural CBD Gummies. Our CBD Gummies have an extraordinary range of potential by offering the familiarity of a gummy bear, a delicious flavor, the chewy candy feel you once loved in your younger years and the benefits that can only be found in CBD. Though other methods of delivery are enjoyed by thousands of people, CBD gummies are increasing rapidly in popularity. Used as a daily supplement, our CBDfx CBD Gummy Bears retain the same benefits as the rest of our product lineup, providing great potency, it’s 100% vegan, it contains no genetically modified organisms (non-GMO), it’s gluten free, no corn syrup or artificial sweeteners were used in its ingredients, and it comes coupled with a full-spectrum CBD using our proprietary blend. Providing you with a daily organically grown CBD dose, our sweet treats are perfect for those on-the-go individuals, shelling out 5mg of active Full Spectrum CBD per natural gummy. 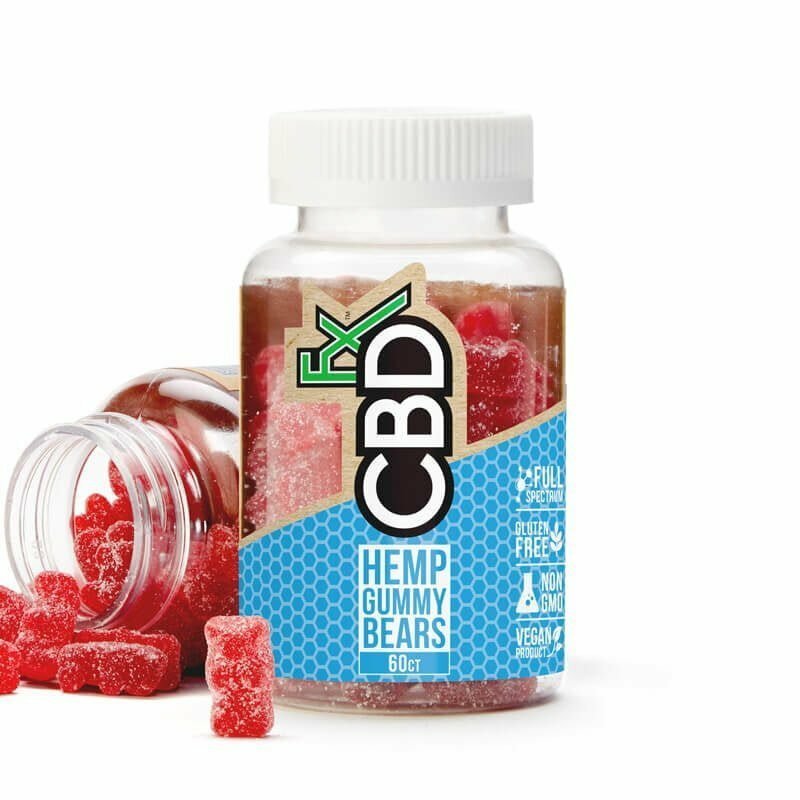 Each bottle features an appealing label that provides all necessary information and contains approximately 60 CBD infused gummies, totaling 300mg. We also have our CBD Gummies 8ct Pouch, which is 8 CBD gummy bears packing 5mg of pure CBD oil each and 40 mg CBD in total. You’ll enjoy the delicious taste of a berry flavor to please your sweet tooth, packing in the fruity, juicy taste of an all-natural delicious gummy. Your body will be even more thrilled as it takes in all of the nutrients that CBD offers. For each piece of CBDfx CBD gummy bear that you enjoy, you’re taking our full line of vegan and gluten-free ingredients, including CBD oil, organic pectin, organic cane sugar, organic tapioca syrup, and natural flavors. Expanding across the board, the CBD industry is alive, well, and has growing for the past couple of years. Its immense growth started when a Harvard graduate successfully extracted CBD from a Cannabis sativa plant and has continued its momentum due to its extraordinary health and wellness benefits. In 2017 the U.S. CBD industry grew by nearly 40%, and after a set of relaxed hemp regulations were achieved from the 2018 Farm Bill restoring industrial hemp to nationwide legal production, reports have predicted it to triple in size by 2022, reaching up to $1.3 billion within just four years. Leading the march forward in this bright future of Cannabidiol is CBDfx! With a full collection of edibles, our two most popular is our CBD Gummies and our Antioxidant CBD Gummies with Turmeric & Spirulina. Combining our organic CBD with turmeric and spirulina delivers extraordinary benefits on top of the properties of CBD. Turmeric is the perfect additive to our gummies that offers a potent antioxidant known for soothing pain and improving cognitive function. Spirulina is another brilliant additive to its make-up that’s one of the most nutrient-dense foods in the world, which is known for its hefty amounts of B vitamins, iron, and more. When you order a bottle or a pouch of our delicious CBD gummies, you’ll have access to our comprehensive lab reports that act as a certificate of analysis. We are a very transparent company and we want our customers to feel confident in the product they’re receiving. Our CBD gummies are organic, uses only the finest ingredients, and presents incredible quality. We provide a full downloadable report with a full list of ingredients and ensuring the quality will meet and exceed expectations. If you’re looking for a delicious CBD treat, you’re going to love our CBDfx CBD Gummies. CBD derived from industrial hemp is absolutely and totally legal to purchase in the United States. Don’t get CBD confused with THC, the compound in cannabis that results in the “high” feeling. CBD does not cause a “high” and is therefore not scheduled by US law. Can CBD gummies be used for anxiety? CBD’s effect is not yet fully understood by researchers, and we’re certainly not in a position to make any definitive medical claims about CBD’s palliative effect on anxiety. However, there is a wealth of research that exists pointing to CBD’s likely efficacy as an anxiolytic (anti-anxiety) option, and the reviews on our site are rife with anecdotal testimonials from our customers. The best course of action is always to consult with your personal physician first, and then try cannabidiol for yourself to determine if it provides you with anxiety relief. What are some other CBD benefits? The truth is, we’re only just beginning to understand the full range of potential that CBD may possess as a therapeutic agent. However, current research and reasons why people use CBD revolve around potential anti-psychotic effects, nausea relief, improved cardiovascular health, lower incidence of diabetes, and more. Our Knowledge Hub contains a wealth of the latest information and studies, so that you can make your own determination about whether you want to try CBD for yourself. Is CBD equally as effective whether you vape it or consume it? Your body will effectively metabolize CBD whether you vape it, eat it, or drink it. 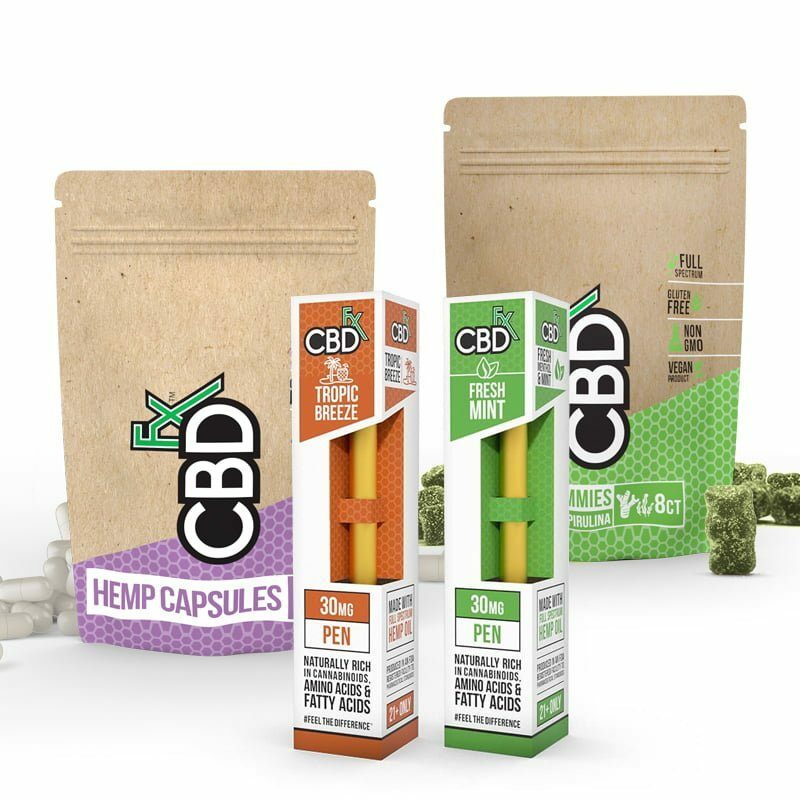 Determining whether you’d rather vape or consume your CBD is totally a matter of preference, and the wide variety of products at CBDfx reflects the spectrum of preferences and personalities of our customers. No product is any more or less effective than another, although the dosage amount may vary by a few milligrams from one edible to another. What is CBDfx's commitment to organic ingredients? Still not sure? Have a look at the latest lab report that includes your CBD gummies batch, available right here on our site. Our partner farms in Europe send our products directly to the CBDfx labs in Southern California. No middlemen, no unnecessary processing, no harmful additives. Have a question about what’s in your CBD oil or how it got there? We’d love to hear from you and tell you about our process. I’ve never tried CBD gummies. What can I expect? I have pain. How much will CBD gummies help? People struggling with serious medical conditions are also appreciating the beneficial effects of CBD edibles. “I have been using CBD Gummy Bears for almost two years to help treat my progressive Multiple Sclerosis. They are great for relieving pain and for muscle spasms,” says Jody N.
Do these CBD gummies work for anxiety? Will these CBD Gummy Bears help me sleep? Do these CBD Gummies relieve common aches and other problems? Even more active people are discovering the benefits of CBD gummies. “I use them post workout to help with relaxation and inflammation and they do wonders,” Chom reports. The CBD “usually kicks in within about 30 minutes or so and I'm feeling good. How do CBD Gummy Bears work for kids? How do CBD Gummies work for seniors? The process of aging is hard on the people going through it and their loved ones, many of whom have discovered the benefits of CBD for their elders. Suzette W. says her 97-year-old father-in-law has severe dementia and is often agitated. She and her husband gave him CBD edibles and “within a week, the nurses and staff members began telling us how much he'd changed: He’s now pleasant, helps bathe and dress himself, and is more social, choosing to sit in the common area instead of finding a spot away from everyone or simply sleeping through the day. It was astounding the difference this product made in such a short period of time. His doctor has now given us permission to leave a month supply with the staff.” Kristina’s dad is dealing with Parkinson’s disease. CBD gummy bears “significantly helps with his anxiety and tremor,” she says. How are these CBD gummies better than other CBD gummies? Those who care about the quality of the ingredients in CBD products they take find that CBDfx CBD gummies are exceptional. “After much research on CBD gummies I came across this product. One of the many things I like about this product is you can actually read the label and understand the ingredients,” says Ron D.
“I love the simple, vegan ingredients,” Robin L. says. Of course, the flavor of CBD edibles matters a lot, too. “Some CBD gummies have an extremely earthy taste to them,” Beckie says. “Not these! They are super tasty.” Michelle W. adds, “I've had a few vegan CBD gummy brands and this was by far the best tasting I've tried without sacrificing effectiveness. What’s in the bottle or pouch? Whether you choose CBD Gummy Bears or CBD Gummies with Turmeric or Spirulina, you get 5 milligrams of organically grown, full-spectrum CBD oil in each chewy edible candy. The CBD hemp oil is blended into gummies with other high-quality, vegan, gluten-free, non-GMO ingredients—but absolutely no animal gelatin, corn syrup, or artificial additives. Each bottle contains 60 delicious gummies. You get 8 gummies in a pouch, so they’re easy to take with you wherever you go. How do I use a CBD gummies? Always begin by reading and following the directions on the label. We generally recommend starting with one or two gummies at a time (depending on your size and experience with CBD). Will my CBD gummies arrive quickly?